What is the default value for Fill Factor? 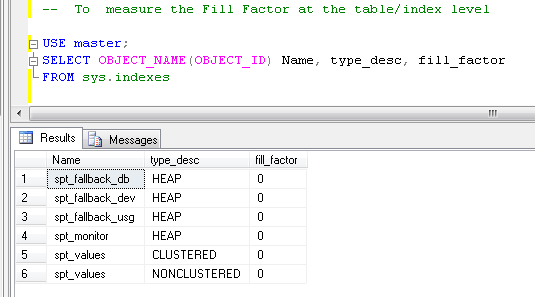 How to measure the Fill Factor in Sql Server? As we know the data in the table is stored in the data pages of the database according to the order of the values in the indexed columns. It means When the value of clustered or non clustered index is created or changed, SQL Server reorganizes the storage of the data in the table. Fill factor is the value that determines the percentage of space on each leaf-level page to be filled with data. In an SQL Server, the smallest unit is a page, which is made of Page with size 8K.Avery page can store many rows it is tottaly depends upon the size of the row. The default value for a Fill Factor is 100. If the value of fill factor is 100, It means there is no or very little empty space left in the page. Note: Never forget the fill factor is implemented only when the index is created; it is not maintained after the index is created as data is added, deleted, or updated in the table.